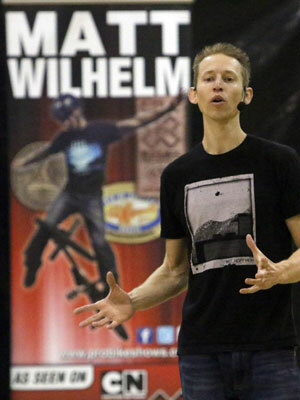 Matt Wilhelm is a nationally recognized speaker on the topic of bullying. He appeared in Cartoon Network’s award winning documentary Stop Bullying: Speak Up with President Obama. However, his program is more than just an anti-bullying “Don’t do that” type of assembly. He focuses more on social-emotional learning. Students will learn about empathy, resilience, and respect. Kindness is the key to preventing bullying. His main focus is not on the kids who bully or even on their targets, but rather on everyone else… the bystanders. Those are the students who have the most power and can actually make a real and immediate difference. Matt transforms bystanders into heroes. Anti-bullying school assemblies for elementary and middle schools. 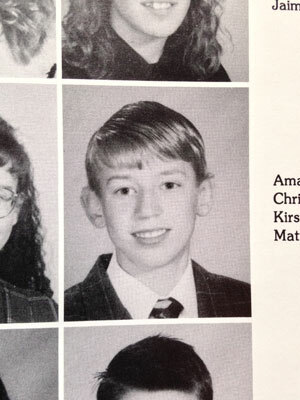 Growing up Matt was made fun of for being “different” and riding BMX. 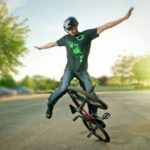 He was going to quit riding BMX altogether after an intense bullying episode at the local dirt jumps. 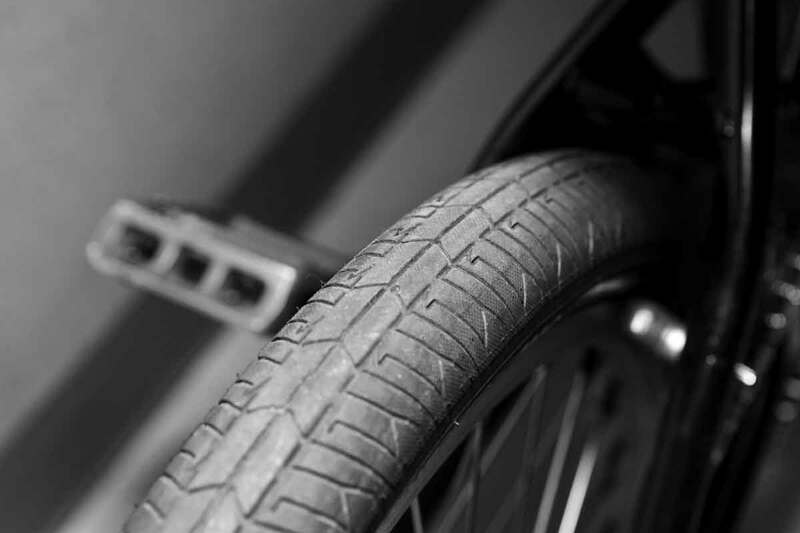 However, another BMX rider had the courage to stand up for him and include him into the group. This one small act of kindness changed Matt’s life. Matt Wilhelm’s anti-bullying program empowers kids to stand up for others, stand up for themselves, and be everyday heroes. Hi Matt, I'm Ben from Ellsworth Middle School. I am really proud to say that after you came everyone stopped bullying me and I just want to say thank you. Things in our school got way better all because of you. I can't believe you have made a huge difference for not only me, but for everyone. I found strength and comfort from your words. You gave me hope when I lost my way and helped me see things in a positive way. You know words can't even describe how thankful I am right now. It doesn’t matter if your students are in elementary school or middle school. 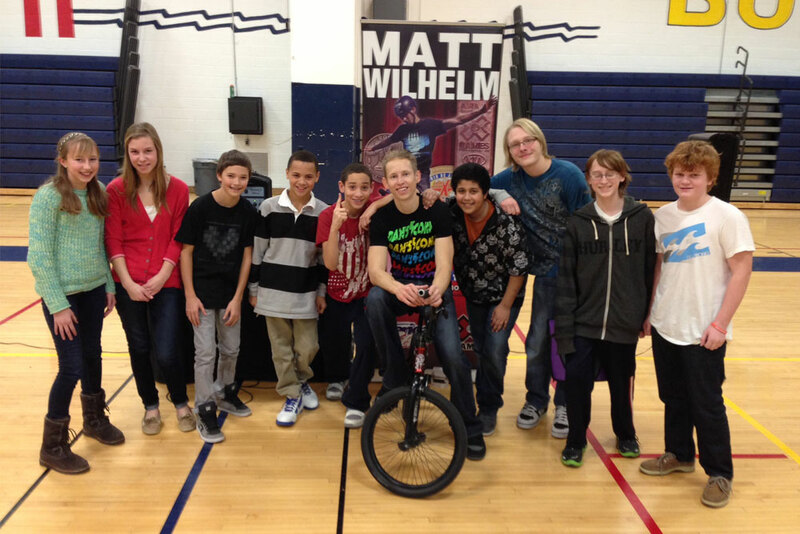 They will be engaged, impressed, and inspired with Matt Wilhelm’s amazing program. Matt Wilhelm has been speaking about bullying since 2006… before it was trendy. He has seen the topic of bullying rise in popularity during that time. While this recent attention is great for the overall cause, many speakers and entertainers have jumped on the anti-bullying bandwagon with mixed results. Other programs make things worse by offering mediocre advice, giving the wrong information, or simply rattling off statistics about how many kids are being bullied. Giving statistics about bullying is not going to change anyone’s behavior. Often this makes the problem worse because kids get fatigued hearing about bullying and become apathetic. That’s why it’s so important to get the right person to talk about this critical issue. Matt’s mission is to change hearts and minds. Below are the philosophies and thoughts behind his program. The word “bully” is overused in today’s culture. Matt seldom uses the word “bully” and never refers to anyone directly as a “bully” Bullying is a complex issue and labeling a kid as a “bully” is not accurate. Matt uses the word “bully” only to describe what bullying is and what it is not. He might also say “The kids who bullied me” rather than “the bullies.” Referring to certain children as “bullies” continues to perpetuate the stereotype that only bad kids are bullies. In reality the role of bully and target often can switch during a child’s life. A target one year can become the perpetrator the next. The issue isn’t as black and white as many would like to believe. Although Matt went through a tough time, you will never hear him refer to himself as a “victim.” Instead Matt uses the word “target.” What’s the difference? A victim is someone who feels powerless and unable to change their current situation. This mindset perpetuates a negative self-image. A target on the other hand can conquer and overcome their challenges. You can take your best shot at a target and still miss. Being the target of a bullying situation does not mean that the instigators have won, as a target you can still come out on top. Victims are powerless, while targets are resilient. Many times we only hear the negative outcomes of bullying stories. The media and news organizations love to focus on these negative stories as they truly are often heartbreaking. However, while these stories are sad and should be told, what kind of message does it send to young people? Do bullied kids begin to think that drastic measures such as suicide or school shootings are an option for revenge? Do these stories leave kids thinking there is no hope? That’s why Matt believes that his story needs to be heard, too. His story has a happy ending. Kids need to hear a story of someone who went through a very difficult time, and not only came out on the other side, but also came out even stronger. Matt’s story is truly unforgettable. Targets and victims walk away empowered and ready to bounce back from whatever life throws their way. The thing that really amazed and inspired me was your story. I got bullied everyday last year... Your story yesterday inspired me so much to never give up! Matt encourages kids to be heroes by doing something small. Kids and teens are constantly told to stand up for one another and do the right thing. While this is a great idea, there is usually one key component missing: WHY? Why should they? Why should they risk all of their social status and popularity to stick their neck out for someone else? Many times students already know what to do; they just need to be motivated to do it. Enter… Matt Wilhelm. Matt believes there is a hero inside each and every person. The challenge is bringing the hero to the outside. Luckily kids are bombarded with superheroes every single day. If you can make them realize that they can be heroes too, by doing something small, they are more likely to act. Being a hero doesn’t necessarily mean having to speak up directly to the kids who are doing the bullying. Many times a less risky action will have a bigger impact. Matt encourages students to stand up for one another in a safe way. Kids are more likely to stand up for someone if it doesn’t seem so intimidating. Plus, Matt gets the idea across that being a hero is so much cooler than just being popular. Join the 300+ schools that Matt visits every year. To get pricing, availability, and more info simply fill out the form BELOW. 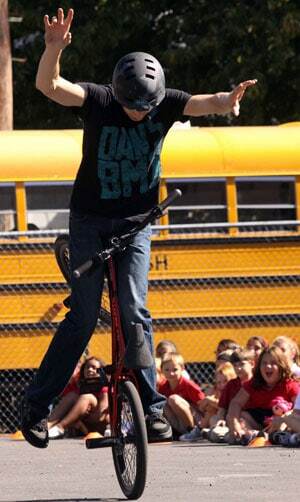 Matt Wilhelm provides high-energy BMX stunt shows, while sharing his personal stories with students.